Browse For Change by iBryte - Boost Your PC. What is Browse For Change? Browse for Change is an affiliate and advertising platform with the intention to 'make it easy to support your favorite nonprofit every time you shop online'. By shopping online with the installed Browse for Change web browser extension installed, Browse for Change will collect affiliate dollars by injecting affiliate identifications into the shopping and purchasing experience. Browse for Change will then send a proceed of the affiliate collection to the branded charity of the web browser extension. Download Boost and enjoy your PC. Remove Browse For Change from your PC. 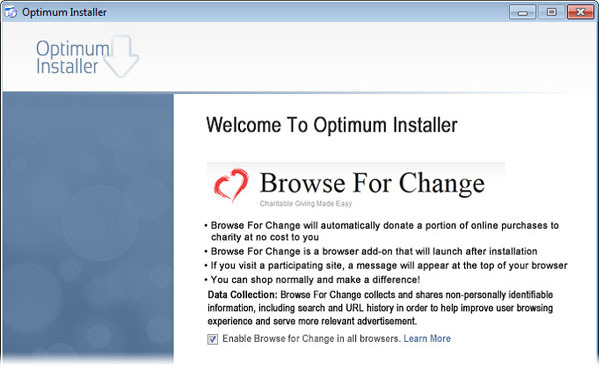 Why should I uninstall Browse For Change? Removing unwanted invisible web browser extensions is usually a good idea. This extension, along with many browser plug-ins, has the potential to cause stability issues within the web browsers they load into, effecting overall PC performance. This extension is known to monitor your search queries and browsing habits in order to send you targeted ads and modify your search settings and results. To the right of the list item, click the Uninstall button and Boost will completely remove Browse For Change from your PC. Use Add/Remove Programs control panel in Windows makes to uninstall Browse For Change. Follow the appropriate instructions below to use this control panel. Select Browse For Change from the list of programs, and click Uninstall. Alternatively, right-click the program and select Uninstall. Select Browse For Change from the program list, and click Uninstall. Alternatively, right-click the program and select Uninstall. Select Browse For Change from the list of programs and click Remove. Boost helps you remove Browse For Change by iBryte and optimize your PC.